Hello Aspirants, Soon CDS 2 2018 exam will be held in different parts of the country and a large number of students have applied for the CDS written exams. So the candidates who are giving the paper for the first time need to know the exact paper pattern so that they can score well for the exam. All the aspirants seem worried about the written exam paper. 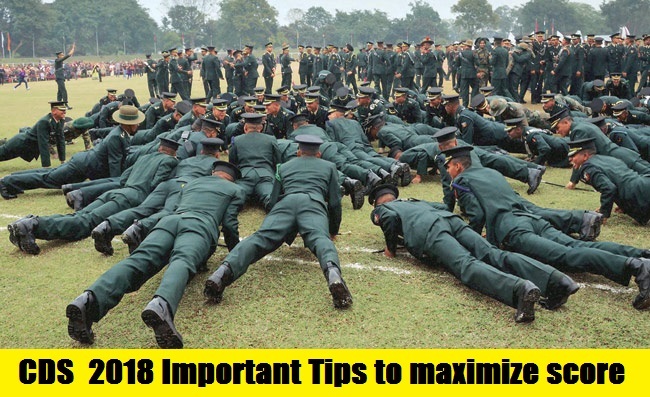 Given your preparation levels, and with very little time left, here's how you can maximize your score for the CDS exams.Checkout the complete article and read the steps how you can score well in the exams. For any questions kindly comment below. Our School exams were knowledge based exams, but this CDS exams are skills based exams as you have to solved 120 Questions for English and GS in 120 minutes each and 100 Questions for Mathematics in 120 minutes. Paper will consist the questions from different subjects like English, General Knowledge, Current affairs, Mathematics and reasoning so you have to be quick in the exam so score a good score in the exam. You should also know the topic which will be asked for this subjects and also the number of questions for each topics. Checkout the below link to know in details. This is not the time for learning new concepts the time has gone now you should just revise what ever you have prepared for the exams as it is said - You do not have to know everything. Now its the time you should analyze your strengths and weakness and work on that topic where you are sure that you can attempt any questions of that topic. For eg say some people have strong aptitude so they can solve easily and accurately.So stay positive and relaxed. Do not sacrifice sleep for revision under any circumstance. As mentioned before, this exam is all about speed and good decision making. Insufficient sleep has been proven to mess up decision making skills. So just keep calm and work accordingly. So just revise all your current affairs, GK, Mathematics formula, English synonyms & Antonyms etc which will play important role in increasing your score for the exams. Aspirants need to know to select good questions in the exams while reading the question they should know whether they can do it or not. You are not allowed to waste time in questions which you haven't prepared in the exams as this will cause waste of time and you may not reach till the questions which you have prepared for the exams. If you find the question easy, answer it. If it is doable but time consuming, postpone it. If it is a known weakness or seems difficult then attempt later only after the 'postponed' questions have been dealt with. Just focus on the prepared questions first and deal with the left questions once you have answered all the questions you are sure about. Areas of perfection and weakness. Which are your areas of ease? - In which section are you more likely to score better? - What type of questions you are normally able to solve? What are your weak areas? - Which questions are most unlikely to be solved by you? - Which sections are more likely to take too much of your time and effort? This is very important for the aspirants who think that if they don't know the answer they will make a guess from the options given. Please don't if you really want to clear the CDS exams just be positive and answer the questions where you are 100% sure about as negative marking can lower your score and you wont able to clear the cutoff marks in the exams. If you want you may for few questions to try your luck but not for every question this will surely affect your scoring. So just focus on the ares you are confident. If you’re weak at Logical Reasoning, you can prepare and do well in Verbal Ability, to clear the cut-off for the CDS exams you should plan well where you have to focus and on which section of the paper so that it becomes easy for you to easily clear the cutoff for the exams. But do remember the goal isn't to clear the only cutoff marks but to get in to merit list too so prepare that way for the exams. “Elimination Rule” is a much discussed rule during the CDS exams. Sometimes, the options given in a question are such that you might not even need to solve it. You can simply eliminate any option through simple logic and common sense. This could potentially avoid any wastage of time and you may just solve the question easily and accurately. Keeping the above mentioned points in mind will help you significantly. Remember that you can’t get back the time you have wasted until now. You only have to focus on how to utilize the available time in the best possible way. So this was all about the CDS 2 2018 : Important Tips to maximize your score . Hope you liked our article this will surely help you a lot for your CDS exams. Feel free to ask questions below in comments. Be patient and keep working on your goal. All the best.